If you are interested in the information I may try again, but I'm trying to contact friends who are scientists to help my gather more information. Go ahead, i think we need more science on this forum not less! I want to get in touch with my scientist friends who are molecular biologists and ask them some questions. If I can I'll present what I learn. It may take a few days or a weeks. I have done a number of woods, cedar, spruce, maple, birch, oak, jatoba, cherry. Heating above the boiling point of water removes the free water in the wood but does not change the composition of the wood. Left for a time the wood reabsorbs the moisture from the air. When you get up to 380 F the the hemicellulose starts to break down. The temperature is approximate as the amount of water vapor in the atmosphere seems to play a part in the reduction of the hemicellulose. Steam in the air lowers the temperature the reduction takes place. In the end the wood looses mass, which would seem obvious. But the measurement before needs to be taken after the wood is in its 100% dry state. The wood needs to be heated above water's boiling point to drive off the moisture that changes with humidity level and then measured. When I was testing the process in in oven I measured the mass before the wood went in, after soaking at 250 F, after being treated at 385 F, weeks later. I also did a rough stiffness test of the sample along with the mass measurements. I made a three point measurement jig with a weight and a dial gauge. The dried wood was stiffer than it was before being dried in the oven. The treated piece a little stiffer yet. I also made a control sample that did not get the treatment but did get dried and then was allowed to go back to normal. This was a few years ago and the results were just recorded on a scrap of paper that has long ago gone its way. While it was enough to convince me that the process does more than just darkens the wood I always planned to get back to doing a more accurate test but that time has not come yet. I did spend a few months trying to learn about torrefaction of wood, as others have said most of the information relates to making fuel. I do not have a chemical background but rather have been schooled as an Instrumentation Technologist. One area of my field is the petrochemical industry and I have a rudimentary understanding of the distillation process used to turn the black gold into something useful. So the concepts of torrefaction did not seem like too big a step for me. I also worked in a mechanical test lab where I also spent time taking care of heat treating ovens and furnaces. Hopefully in retirement I will use some of my knowledge (what is left of it) to build a little basement test lab to investigate some areas of guitar construction. Got to keep the mind active. Sorry I missed Stephan's posts before they were deleted. I like taking in the ideas of others. A question was asked about baked cedar. The top and sides were baked, cedar and birch, the birch pieces I scavenged from a pallet. Need to make a neck for this one. Expect to need a large footprint bridge for it since the wood is not as tough as it was in its original state. In torrefaction process wood properties change towards properties of coal. You get rid off water, lingin and sugar and get a bit lighter wood in that way. 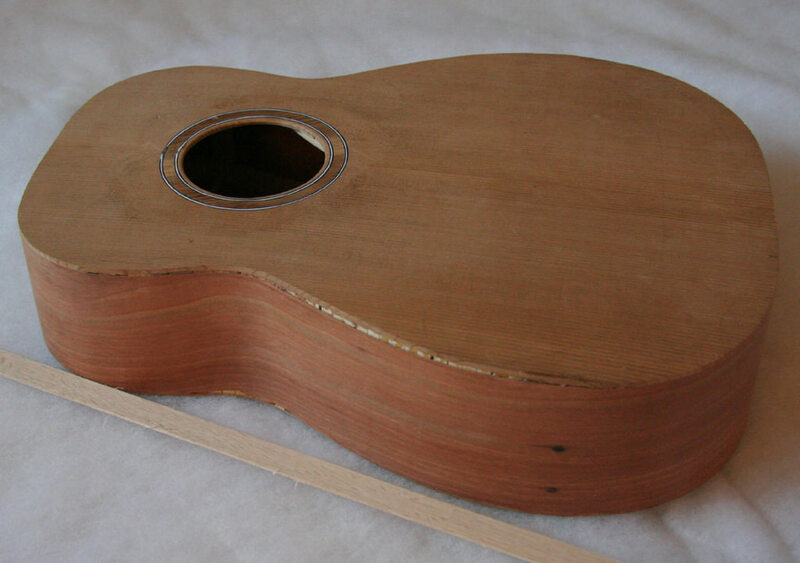 But is this little change off properties any/so beneficial in luthiery that it is worth to do, I doubt and that is simply because never seen a high level concert guitar where the top is baked. I originally tried it as a way to make guitars less sensitive to humidity changes. I see it as producing a different material with different propertied to work with. Some people only use spruce and have no desire to build with cedar. Most people do not build high level concert guitars. It is not touted for being a silver bullet for building. Some like it and some do not. Like most things in life. I started a guitar for myself this last weekend. I was debating doing the wood and decided against it. I did not think it would add much to the instrument and make it harder to build with if I did. On another project I may use it again.